Is a 1.5°C climate change target still achievable? While we ponder whether we will overshoot the already dangerous level of 2 Degrees Celsius of warming on the way to 4C or 5C degrees warming by the end of the century, scientists have assessed whether it is still possible to restrict global warming to just 1.5C degrees. The short answer? Yes, it is technologically possible, but requires substantial and immediate emissions reductions with no room for further delay or obstruction. The new study by researchers at the International Institute for Applied Systems Analysis (IIASA) and Potsdam Institute for Climate Impact Research (PIK) was published in Nature Climate Change examines scenarios for the energy, economy, and environment that are consistent with limiting climate change to 1.5 degrees Celsius above pre-industrial levels, and compares them to scenarios for limiting climate change to 2 degrees Celsius. More than 100 nations support the goal of limiting warming to 1.5C degrees - that is over two thirds of UNFCCC nation signatories. Understandably, the Alliance of Small Island States (AOSIS) are particularly vocal for this limit. Many of the small low lying island nations will not survive the impacts of sea level rise with the higher target. They are supported by the Least-Developed Countries (LDCs) block. Whether we attempt to draw the line at 2 degrees or 1.5 degrees, there is a tight constraint on future carbon emissions. Accelerating energy efficiency was identified as a key enabling factor in limiting warming to 1.5C degrees. The scenarios modelled also indicate that negative carbon emissions would be necessary at a global scale later this century. This would require either using bioenergy combined with carbon capture and storage on a scale this is presently untested, or extensive afforestation for carbon sequestration. Both of these would need to balance carbon reduction against the importance of land for food production. In the scenarios considered, rather than set an absolute temperature limit, the longer term goal was considered whereby the target temperature may be exceeded but then decline and stabilise. 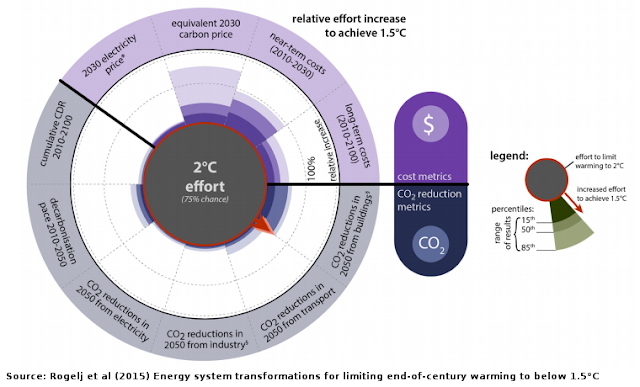 The study has prepared charts showing the relative effort increase to achieve 1.5°C. The extra effort required from a 2 C degrees effort (75 per cent chance) requires extra CO2 reduction from buildings and slight increases in other areas. Near term extra costs are moderate, long term extra costs are manageable, but the scenario requires a substantive global carbon price. 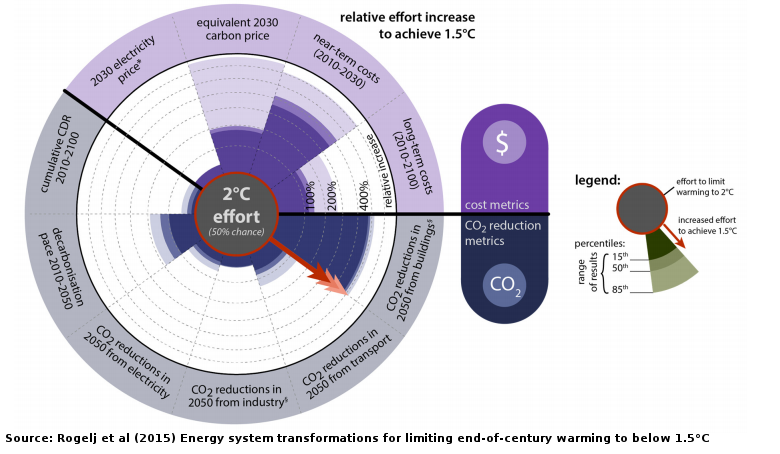 The costs and effort increase markedly to increase the relative effort to achieve 1.5°C from a 2C degree (50 per cent chance) level. The target temperature has been left open in UNFCCC discussions, whether it is 2C degrees or 1.5C degrees. The target is up for debate at the Paris climate talks in December this year. This study makes it clear that 1.5C target is still, but barely, achievable with an increase of international efforts to curb greenhouse gases. It should be essential reading for delegates to Paris to spur ambition with greenhouse gas reductions, rather than stay on track for the 4 to 6 degrees C of global warming warned by the World Bank report in November 2012. Petra Tschakert has written an interesting commentary on the 1.5°C or 2°C science policy debate at COP20 in Lima, Peru. It is available in full at Climate Change Responses: 1.5°C or 2°C: a conduit’s view from the science-policy interface at COP20 in Lima, Peru. She concludes, "Significant negative impacts, limits to adaptation, and anticipated worsening of trends from a 0.8°C warming since pre-industrial times onwards already indicate a clear need for strengthening the long-term global goal. ... With the currently implemented mitigation policies, however, the world is likely on track to 3.7°C–4.8°C warming by 2100." She then outlines the realistic prospects available for staying below a 1.5°C warming throughout the 21st century. "IPCC results suggest that limiting temperature increase to <1.5°C by 2100 would require concentration of less than 430 ppm CO2-eq, an enormous challenge.... 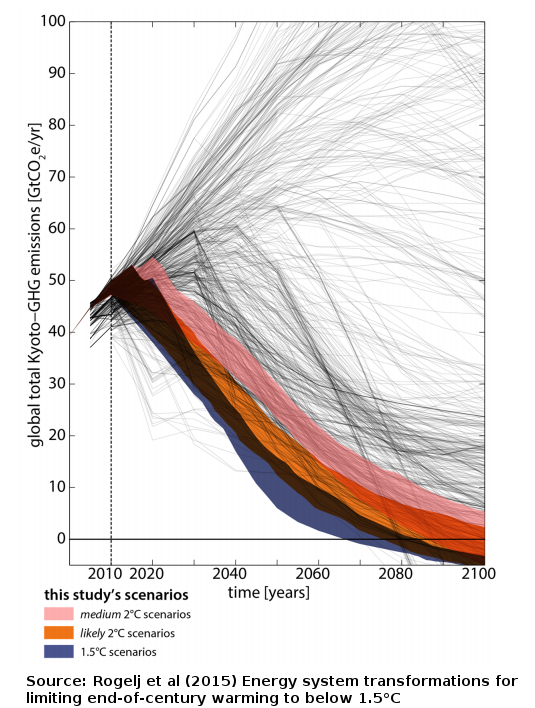 Under the best case scenario, such an ambitious target would mean peaking close to 1.5°C by mid-century before slowly declining to below this level. While the literature on the feasibility of reaching this target remains scarce, aggressive mitigation strategies would be fundamental, without any further delay. This entails not only swift global cooperation and exemplary institutional agreements but also massive investments in decarbonizing the global economy with zero net emissions before the end of the century as well as substantial and early negative emissions, particularly carbon dioxide removal strategies such as carbon capture and storage (CCS). Yet, some CCS strategies are technologically not yet available, too costly, too risky, or not ready to be scaled up, while bioenergy-driven CCS triggers competition over land and may well threaten food security. Delaying action will substantially increase costs, with mitigation costs already highest for Africa, and likely close the small window available. While some argue that a 1.5°C scenario is still feasible, others judge it as no longer within reach." Tschakert makes clear that the debate and discussion is not just about targets, but overcoming "deeply entrenched divisions on value judgments, responsibility, and finance." between the developed world and the least developed and devoping nations and peoples. It is about our respective willingness to understand and buffer against risks and to pay for abatement and compensation, not merely about reaching or not reaching a single-index number goal. It is about acknowledging that negative impacts of climate change under a 0.8°C temperature increase are already widespread, across the globe, and that danger, risk, and harm would be utterly unacceptable in a 2°C warmer world, largely for ‘them’—the mollusks, and coral reefs, and the poor and marginalized populations, not only in poor countries—even if this danger has not quite hit home yet for ‘us’. And this is why this political process is so extraordinarily difficult and slow, and nonetheless necessary. Climate-related risks expressed through the Five Reasons for Concern. The color shading indicates the additional risks due to climate change when a temperature level is reached and then sustained or exceeded. Source: IPCC AR5 WGII Summary for Policy Makers, 2014. The study by IIASA makes it clear that there is little room to move if we want to limit warming. It is the intransigence of the fossil fuel industry and developed nations that is obstructing the pathway to rapid and substantial emission reduction and the possibility of a safe climate for future generations. 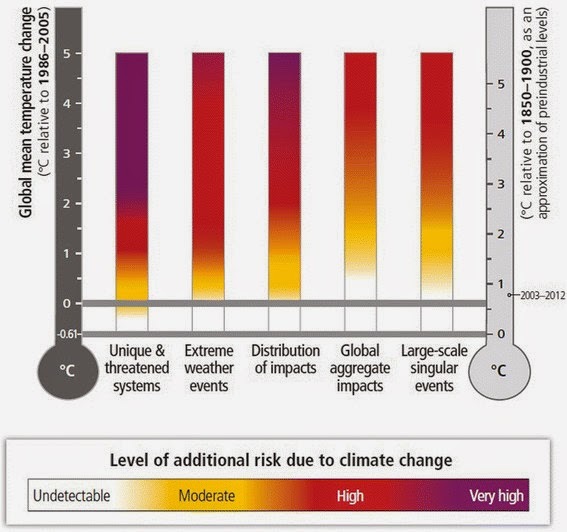 Many impacts projected for a global warming level of 2 °C relative to pre-industrial levels may exceed the coping capacities of particularly vulnerable countries. Therefore, many countries advocate limiting warming to below 1.5 °C. Here we analyse integrated energy–economy–environment scenarios that keep warming to below 1.5 °C by 2100. We find that in such scenarios, energy-system transformations are in many aspects similar to 2 °C-consistent scenarios, but show a faster scale-up of mitigation action in most sectors, leading to observable differences in emission reductions in 2030 and 2050. The move from a 2 °C- to a 1.5 °C-consistent world will be achieved mainly through additional reductions of CO2. This implies an earlier transition to net zero carbon emissions worldwide, to be achieved between 2045 and 2060. Energy efficiency and stringent early reductions are key to retain a possibility for limiting warming to below 1.5 °C by 2100. The window for achieving this goal is small and rapidly closing. Based upon media materials from International Institute for Applied Systems Analysis, 21 May 2015, What would it take to limit climate change to 1.5°C? John Englart (@takvera) and his teenage daughter Tarryn Clancy (@climateteen) will be travelling to Paris to report on the United Nations COP21 climate talks (including for Australian citizen journalist site Nofibs), and in particular what role Australia plays in those negotiations.